Compiz is very popular for its fancy graphical effects. But there is another very useful feature in Compiz. It lets you put window on top, skip taskbar, skip pager, always below, sticky, non movable, resizeable, minimizable, closabe and so on. You must be telling so whats new you can make window sticky or always on top by right clicking the title bar and selecting always on top. Yes you can but with that you have to do so every time you open the window, with Compiz it is just one shot. For case in point look at my audacious. It automatically starts on the bottom corner and is always on top and I can control my music whenever I want. 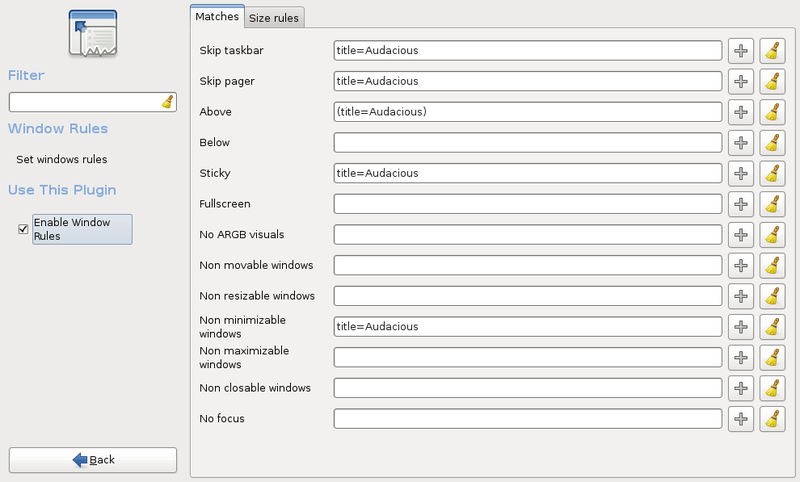 Go to System, Preferences, Advance Desktop Effect Settings, Window Management and Window Rules. It helps me a lot, thanks ! !